The leading sound expert demonstrates via interviews with world-class speakers, professional performers and CEOs atop their field, the secret lies in developing simple habits that can transform our power in communication, the quality of our relationships and our impact in the world. Transform your communication skills: Have you ever felt like you're talking, but nobody is listening? 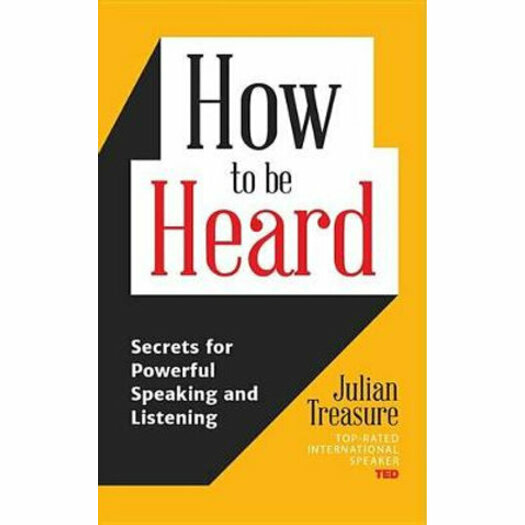 Renowned five time TED Talks speaker and author Julian Treasure reveals how to speak so that people listen - and how to listen so that people feel heard. As this leading sound expert demonstrates via interviews with world-class speakers, professional performers and CEOs atop their field, the secret lies in developing simple habits that can transform our communication skills, the quality of our relationships and our impact in the world. Sound affects us all: how to make it work for you and improve your wellbeing, effectiveness and happiness. Why listening matters. How listening and speaking affect one another. The seven deadly sins of speaking and listening, and how to avoid them; the four cornerstones of powerful speaking and listening. How to listen and why we don't. Your listening filters, and how to use them. Five simple exercises to achieve conscious listening. Tips from great listeners. Inner listening. Your voice: the instrument we all play, and how to play it beautifully. The power of your vocal toolbox and how to build your speaking power; tricks of great speakers; simple exercises and practices to develop your voice. Saying what you mean: how to plan and structure content so you always hit the bullseye. Clean language. Secrets of rhetoric; great speeches unpacked; exercises and methods to achieve clarity, precision and impact. Five danger words to avoid. Stagecraft: how to deliver a great talk. Practice, preparation, tools and aids, common mistakes and how to avoid them, stage presence - how to act and talk like a top professional speaker and win over any audience. The five most common errors and how to avoid them.